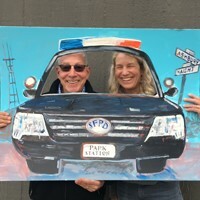 The Park Station Community Police Advisory Board (CPAB) and Park Station hosted the 35th National Night Out in Duboce Park on Tuesday, August 7, the third year in a row that the event was held in Duboce Park and the Harvey Milk Photo Center Exhibition Room and attracted over 600 attendees. Officers from Park Station prepared hot dogs and hamburgers, SAFE hosted a taco truck, and the CPAB provided desserts, all free of charge. There were performances and demonstrations by Acro Sports including Parkour and their Circus. Zanshin Dogo demonstrated Goju Ryu, a traditional martial art and Xian Yun Academy of the Arts California (Fei Tien) demonstrated Chinese dancing. Officer Riley Bandy, one of our Duboce Triangle foot beat officers, brought his jazz combo and performed near the basketball court, the first time we have had live music at the event. “Who Let the Dogs Out” was a light-hearted and fun dog show that was held for the first and had a variety of contests, including Cutest Dog, Best Trick, Waggiest Tail, Best Smile, and Best in Show. The judges were from Muttville Senior Dog Rescue. There were also motorcycles, police cars, and police horses. SAFE and many other law enforcement and civic organizations hosted resource tables, offering tips on health and safety and organizing neighborhood watch groups.